Over the years I’ve accumulated many boxed sets, some of which are stunning, some merely good and a few that were to put it politely a rip-off. Three box sets that fall into the stunning category are the trio of Stax box sets which document every single the label ever released. They’re among my favorite box sets of the many I own. Another box set which joined the first category back in 2008 was Take Me To the River: A Southern Soul Story 1961-1977, an excellent three disc set released by Kent. Since I first bought that box set, it’s been one I’ve cherished, and patiently, I awaited the next box set from Kent. 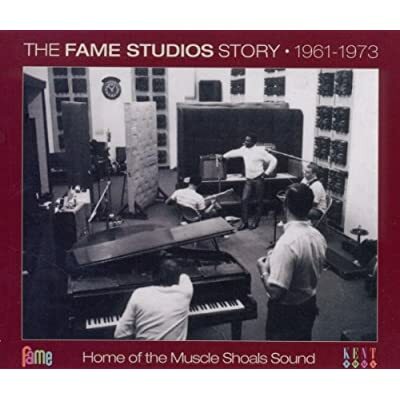 Then, back in November 2011, Kent released another three disc box set The Fame Records Story 1961-1973, documenting the story of one of the most influential record labels in the history of Southern Soul. Since then, The Fame Records Story has been on heavy rotation, as I’ve immersed myself in its beauty. Now I thought I’d share with you my thoughts on what is an unmissable box, one that’s vital for anyone like myself who adores Southern Soul. There aren’t many recording studios that play such an important part in their town’s history, that they’re added to the list of local landmarks and designated part of the town’s heritage. That’s what happened to the Fame Recording Studios in December 1997, when the recording studios were added to the Alabama Register of Landmarks and Heritage. Now if you’re not familiar with the history of Southern Soul, you may be wondering what makes this particular studio so important? The story starts during late fifties when Rick Hall, Tom Stafford and Billy Sherill founded their record label, and built their first studio above the City Drug Store in Florence, Alabama. However, by the early sixties, this nascent partnership would split-up, resulting in Tom Stafford and Rick Hall needing a new studio. They decided to move to what had been a tobacco warehouse in Muscle Shoals, Alabama. As if by magic, Rick Hall soon recorded what would be his first hit single, Arthur Alexander’s You Better Move On. Wisely, he decided to invest the profit in a better studio, and moved to their current location Avalon Avenue in Muscle Shoals, Alabama. The first hit single Rick Hall recorded in his new studio was Jimmy Hughes’ Steal Away. Little did Rick Hall know it back then, but soon his new studio would see artists coming from far and wide to record at Fame. After Rick’s success with Jimmy Hughes, word got out that Fame was the place to go to record a new single or album. Quickly, everyone from Tommy Roe to The Tams, and from Joe Tex, Joe Simon, Wilson Pickett, George Jackson and Clyde McPhatter to Irma Thomas, Etta James, Mitty Collier and even Aretha Franklin arrived at Muscle Shoals. It was at Muscle Shoals that Jerry Wexler brought Aretha Franklin, to record her 1967 album I Never Loved A Man the Way I Loved You. However, why did all these artists choose to head to Muscle Shoals to Fame? Part of the reason was the session musicians that worked with Rick Hall. This included the legendary Muscle Shoals Rhythm Section and Muscle Shoals Horns. They were some of the hottest and tightest musicians of that era, and when they recorded together, they were one of the finest backing bands ever. Between 1961 and 1969, when they departed from Fame to found the rival studio Muscle Shoals Sound Studio. However, their sound graced numerous hit singles and album, many examples of which can be found on The Fame Records Story 1961-1973 box set which I’ll now tell you about. The Fame Records Story 1961-1973 box set is enclosed in a slipcase and once you’ve taken it out the case, you’re greeted with what can only be described as a lavish eighty-four page book. This gives you an in-depth history of Fame Records and the numerous artists that recorded at the famous studios. Included in the book are a variety of photographs which transport you back to Fame’s heyday. Once you’ve worked your way through the label’s history, you come to the track-by-track commentary of the seventy-five sumptuous slices of Southern Soul that are included on the three discs. The tracks are presented in chronological order, complete with a description of the track and photographs, including copies of the original single. This is truly an in-depth and hugely informative historical document that gives an insight into the music and personnel involved. Compilers Tony Rounce and Dean Rudland must be praised for what seems like a labor of love for both of them. After the eighty-four page book comes the music, with each of three discs having a title. Disc One is entitled Steal Away, while Disc Two is Slippin’ Around and Disc Three Get Involved. However, who features on each disc, and what are the box set’s highlights? 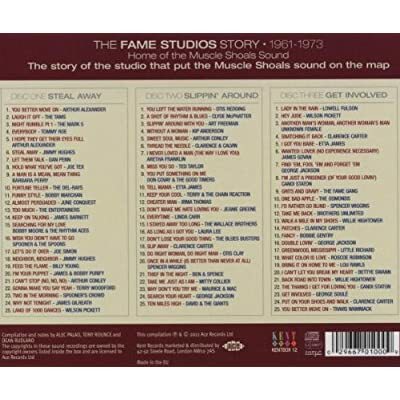 Disc One of The Fame Records Story 1961-1973 box set features music from the early years of the studio’s history. The first track on the album is Arthur Alexander’s You Better Move On, the first recording after Rick Hall and Tom Stafford had split with his former partner Billy Sherill. Tom Stafford knew Arthur Alexander, and had a song in mind for him. With a group of musicians who hung around the City Drug Store backing Arthur, You Better Move On was recorded. This gave the label it’s first hit, when the single was released on Dot Records. With the profit they made from the Jimmy Hughes’ single being reinvested in building a new studio, the Fame story was just beginning. However, this isn’t the only Arthur Alexander track on Disc One, with I Hope They Get Their Eyes Full a previously unreleased track found while the box set was being researched. It was recorded while Arthur was signed to Dot Records who’d released You Better Move On. Jimmy Hughes contributes two tracks to Disc One, Steal Away which was a hit on the Vee Jay label. Again the profits from the track were reinvested by Rick Hall, and used to buy new studios, which are still in use today. The other track Jimmy Hughes contributes is Neighbor, Neighbor which was released as a single in May 1966. This Alton Vallier penned track gave Jimmy a US R&B hit in May 1966, and like Steal Away, is one of Disc One’s highlights. Arthur Conley is an artist whose music I’ve always loved, and the addition of I Can’t Stop (No, No, No) is a welcome one. Written by Dan Penn and Roger Hawkins, and produced by Rick Hall, this track was recorded in 1966 and is one of my favorite tracks on this disc. One track many people will be familiar with is I’m Your Puppet, which has been recorded by many people over the years. When Dann Penn who cowrote the track with Spooner Oldham released the original version, the single failed to chart. However, when it was recorded by James and Bobby Purify and released on Bell Records, it reached number six in the US Billboard 100. This is one of the best recordings of the track, and still sounds as good forty-six years after it was released. My final choice from Disc One is one of Wilson Pickett’s best known and most successful singles. Land of A Thousand Dances was recorded at Fame on 11 May 1966, and can be found on his The Exciting Wilson Pickett album, released on Atlantic Records. When released as a single, Land of A Thousand Dances reached number six in the Billboard 100 and number one in the US R&B Charts. This gave Wilson his biggest ever pop hit and third number one US R&B Single. With such a pedigree it’s a deserved addition to the album. These are just a few of the twenty-five tracks on Disc One. Other tracks worth mentioning are a track written and recorded by Joe Tex’s in 1964 Hold What You’ve Got. Bobby Marcham’s Funny Style, recorded in early 1965, and was released on the Dial label. Finally, Joe Simon’s Let’s Do It Over released in 1965 on the Vee Jay label. These tracks are just some of the many highlights of Disc One, which features a total of twenty-five tracks, where well known tracks sit side-by side with hidden gems. Will Disc Two have such strength in depth? Like the first disc, it’s very much a case of being spoiled for choice on Disc Two. How can I just choose six or seven tracks? However, one of the best tracks on this disc in Otis Redding’s You Left the Water Running. This version is an unedited demo version from 1967, which was recorded when Arthur Conley was recording the stupendous Sweet Soul Music. What I love about the track is the spartan arrangement, with just simple percussion accompanying Otis, allowing his vocal to take centre-stage. During the track, he sings the song twice, complete with ad-libs. Quite simply, it’s a magical, spine-tingling track. It’s thought that Otis recorded You Left the Water Running at the same time as Arthur Conley’s Sweet Soul Music. When Otis produced the track written by Arthur, Otis and Sam Cooke, he probably never realized that Arthur Conley was recording one of the biggest hits in the history of soul music. On its release on Atco, the track reached number two in the US Billboard 100 and US R&B Charts, eventually selling over one million copies, and reaching the top ten throughout Europe. Sadly, eventually, Arthur grew to really dislike this classic track, one that helped launch Fame as soul music’s centre of excellence and where some of the biggest hits were recorded. Just before Arthur Conley recorded Sweet Soul Music, Aretha Franklin had recorded I Never Loved A Man (the Way I Loved You) and parts of Do Right Woman-Do Right Man. Included on Disc Two is I Never Loved A Man (the Way I Loved You). This gave Aretha her first US R&B number one single, and reached number nine in the US Billboard 100. Quite simply this is a stunning track from Aretha Franklin, The Queen of Soul. it would’ve been nice to have Do Right Woman-Do Right Man also on the album, which was the B-side to Never Loved A Man (the Way I Loved You). Two other female soul singers whose music I love also feature on this disc. They are Etta James and Irma Thomas. Etta’s contribution is Tell Mama, the title track from seventh studio album Tell Mama, released in August 1968. Fame was familiar territory for Etta, having recorded there previously. It was at Fame that she recorded the seminal I’d Rather Go Blind, one of Etta’s greatest ever tracks. However, Leonard Chess’ decision to send Etta to Fame worked out, as Tell Mama became Etta’s first album since 1963 to chart, reaching number twenty-one in the US R&B Charts and number eighty-two in the US Billboard 200. Irma Thomas contribution is Cheater Man released on Chess in 1967. Rick Hall recommended Chess sign Irma, and this was the first track for her new label. This should’ve kick-started her career, and made her as popular as Aretha, Gladys Knight and Dionne Warwick, but somehow, this wasn’t to be. After a hurricane devastated New Orleans in 1969, Irma ended up working in retail in Los Angeles until in 1973, Swamp Dogg signed her to the Fungus label and she recorded her comeback album In Between Tears. However, back in 1967, the future looked bright for Irma when she recorded the excellent Cheater Man. Otis Clay is another Southern Soul singer whose music I’m a huge fan of. Back in 1968, Otis recorded his interpretation of Do Right Woman, Do Right Man for the Cotillion label. Produced by Rick Hall and Staff, this is one of the best version of this song, its sheer soulful sound hugely moving and quite beautiful. After recording several singles at Fame, Otis would later sign with Hi Records and release a duo of underrated albums I Can’t Take It and Trying To Live My Life Without You. On Disc Two are a duo of previously unreleased tracks that I must mention. One is by Mitty Collier entitled Take Me As I Am. This was recorded in 1968 when Mitty was signed to Chess, Records. Four years previously, in 1964. she’d recorded I Had A Talk With My Man Last Night, the secular version of the gospel song I Had A Talk With God Last Night. However, by 1968 Mitty’s career was struggling and it was up to Rick Hall to bring out the best in Mitty. This he did, with the resulting album Shades of A Genius released later in 1968. One track that didn’t make it onto Shades of A Genius was Take Me As I Am. Remarkably, this track lay unreleased until this box set was released, and I for one am grateful that it’s at last seen light of day. My final choice from Disc Two is another unreleased track that deserves mentioning, George Jackson’s track Search Your Heart. This was just one of the many tracks written or co-written by George. Here he co-wrote the track with Raymond Moore. It seems almost incredible that a track of such quality was never released, but thankfully, it features both here and on Don’t Count Me Out-The Fame Recordings Volume 1, which features some of his best songs. Two other songs worth mentioning are Clyde McPhatter’s A Shot of Rhythm and Blues which he recorded for Stateside in 1966, when his career was going through a fallow period. Produced by Rick Hall and Bob Montgomery, the duo try their best to revitalize Clyde’s career. However, although the track hasn’t dated as well as other tracks, it demonstrates that Clyde McPhatter was still a talented and versatile singer. Laura Lee, like Etta James and Mitty Collier was another artist signed to Chess who’d been sent to Fame. It was here that she cut As Long As I Got You In 1968, which gave Laura a US R&B hit single. It seems that like Disc One, Disc Two is blessed with a similar quality of music. On this disc are some of the biggest names in the history of soul music, along with a few names you may not be familiar with. There are even a few previously unreleased tracks that make you wonder just why they’ve never been released. One of the best examples is George Jackson’s Search Your Heart. Can Disc Three even come close to matching the quality of its two predecessors? Here’s hoping. Although Lowell Fulson was a blues singer, he like other artists from the Jewel label recorded at Fame. Recorded in 1969, Lady In the Rain was one of the last recordings to feature the original Muscle Shoals Rhythm Section. This track was from Lowell’s In A Heavy Bag album, which is one of his finest albums. One of my favorite tracks from the whole box set is Another Man’s Woman, Another Woman’s Man which is credited to Unknown Female, because the singer’s name is unknown. That’s a shame because this is a stunning, emotive track whose singer deserves credit. The first time I heard it, I just pressed replay three or four times and let the song wash over me. I reveled in the raw emotion and passion displayed by the singer and would love to know who recorded this fantastic track. Candi Staton contributes two tracks to this disc, with I’m Just A Prisoner (Of Your Good Lovin’) from Candi’s 1969 album I’m Just A Prisoner. When released as a single, the track reached number fifty-six in the US R&B Charts. What made this such a great track was the heartache and pain in Candi’s voice, which sounded very real. The other of Candi’s is The Thanks I Get For Loving You, from her 1972 album Candi Staton. By then, Candi was Fame’s biggest artist, inheriting the mantle from Clarence Carter who’d soon become her ex-husband. Here, Candi’s vocal is full of frustration and anger, while sweet sounding backing vocalists accompany her. It’s Southern Soul at its very best. Another Southern Soul belle to record at Fame was Bettye Swann, who recorded I Can’t Let You Break My Heart in 1971. George Barton and Capitol Records prompted Bettye to head to Fame, after her 1969 album Don’t You Ever Get Tired of Hurting Me had seen a country style creep into her music. At Fame, Rick Hall and Phil Wright produced recorded I Can’t Let You Break My Heart an emotive and moving horn heavy track. Of the seventy-five tracks on the box set, Bettye’s track is one of my favorites. Clarence Carter contributes two tracks to this disc, Snatching It Back recorded in 1969, for Atlantic Records. It took a number of takes before the definitive version of the track was cut. However, it was well worth the wait, with the final take an uplifting, driving slice of soul. The other Clarence Carter track Put On Your Shoes and Walk is from March 1973. By then, his career was going through a fallow period, but with Rick Hall producing the track, it gave Clarence a minor chart hit. After this, he’d release two singles which would enter the top twenty, giving his career a welcome boost. Of the other tracks on the disc, a couple of others deserve credit. One of these is a demo version of George Jackson’s entitled Double Lovin’. Like Search Your Heart, it seems incredible that this track lay unreleased for nigh on forty years. This demonstrates the quality of music that was being released by Fame during this period. The other track is Lou Rawls’ fantastic version of Sam Cooke’s Bring It On Home To Me. Produced by Rick Hall and David Axelrod, Bring It On Home was the title track from Lou’s 1970 album, and the last single of Lou’s ever to reach the top forty. On the track, Lou, who sang backing vocals on Sam Cooke’s original version, brings the song to life, throwing himself into the song, as if wanting the track to pay homage to his musical idol. These tracks are just a few of the great tracks on the album. Although most of the songs are Southern Soul, there are a few examples of artists who weren’t soul singers on the album. One example of this is One Bad Apple by the Osmonds. This may seem like a strange choice, but the Osmonds were just one of many pop singers and groups including Liza Minnelli and the Righteous Brothers who recorded at Fame in the late sixties and early seventies. It was at Fame that the Osmonds recorded their first number one single, in February 1971, where it stayed for five weeks. However, the majority of music recorded at Fame was some sumptuous Southern Soul, like many of the tracks on Disc Three and the two preceding discs. So, having read this article, you’ll be wondering whether you should buy this box set? My answer to that is without a doubt. Although it’ll cost you about £25, $38 or €32, for that you get a lavishly illustrated, highly informative and comprehensive sleeve-notes from Tony Rounce and Dean Rudland. They take you through the seventy-five tracks on the album, telling you the story behind this wonderful music. This brings the music to life, and allows you to know more about the majestic music that can be heard on the three discs. A total of seventy-five tracks over the three discs await you, some of which you’ll have heard before, others that will be new to you. Most of them have one thing in common, they’re some scintillating slices of Southern Soul, some of the best you’ll ever hear. If you do decide to invest in this box set, then like me, The Fame Records Story 1961-1973 will never be far from your hi-fi, as you revisit The Muscle Shoals Sound, time and time again.